A few days ago, we were chatting about our all-time social media moments and some bright spark mentioned this one. We all agreed it was the work of legendary social media giants and we were all pretty sure, we had covered it on the blog. However, a quick scan of our archives revealed that we had, in fact, not. If you work in higher education social media, you have likely heard about this feat of modern day perseverance. 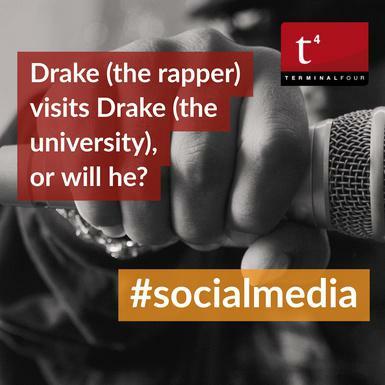 The story begins way back in 2009 when students in Des Moines, Iowa began a social media campaign to get rapper, Drake, to visit his namesake university, Drake. Fast forward to 2016 when the University saw that the Drake was due to play a concert in Des Moines. They did what any self-respecting social media super-stars would do, they tagged him in an Instagram post, telling him to come visit! Within ten minutes, the post had gone viral and Drake had replied hinting that he might just do that. 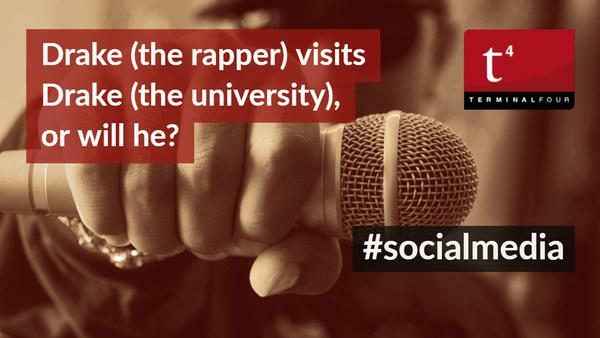 The university decided to go out on a limb and embrace the lighter side of social media and guess what? It paid off. Thousands of students waited for him to show, eventually giving up all hope of his arrival on campus. That night, after his gig a few miles down the road, he made a low-key stop at Drake, posting the proof on his Instagram account. He even went one step further and wore a Drake University jacket on stage. Now, you can't say fairer than that! The publicity that surrounded the #BringDraketoDrake campaign resulted in generous media coverage, including a piece in Time magazine (http://time.com/4517295/bring-drake-to-drake/) , and inclusion on Drake’s own Instagram feed. Perhaps, most importantly it resulted in record-breaking traffic to the university's own website, most notably their application and programs sections. This stroke of social media genius still has to be one of our favorite campaigns of all times! The University are still capitalizing on their good fortune by including a helpful guide to show people where to stand when they want to recapture the by-now-infamous Drake comes to Drake photo.